This year’s annual meeting theme will have a focus on Learning Assessment. We will be led in our discussions and deliberations throughout the event with internationally-renowned plenary speakers such as Drs. Cees van der Vleuten, Olle ten Cate, Geoff Norman, and other innovation leaders. The language of assessment takes on a world of terminology and best-practice trendings that enliven our daily academic conversations and research (rubrics, evaluation, generational learning needs, formative/summative, feedback, learning portfolios, entrustable professional activities, competency, judgement, peer-assessment, self-reflection, objective/subjective, TBL, PBL, resilience, etc.) and will prove to be the basis for our meeting’s posters, oral sessions and workshops. Our beautiful venue in Leiden could not be more inviting and conducive to our gathering and to our individual and group exploration of the quaint and historical Dutch surroundings. Please do plan to join us in The Netherlands this June 2016; there will be much to experience both professionally and culturally so bring yourself, your colleagues, and your families! As Chairman of our Membership Committee I am writing to make a special request. The committee has been working hard on recruiting strategies to expand our membership and to make sure that IAMSE remains inclusive of all fields of medical study. To that end we recently began discussions on how to determine how diverse we are as a group. We have determined from those conversations that the current profile settings on our website are not sufficient to give us that estimate. Those profile settings have now been edited so that we can get more information on the diversity of our membership. At this time we are asking that you take a few minutes to visit the IAMSE member profile website here so that you can update your personal settings. These updates will allow the membership committee to determine what proportion of our membership are nursing educators, chiropractic educators, allopathic and osteopathic educators, alternative medicine educators, optometry educators, etc. Leslie Wimsatt was appointed as Associate Dean for Academic Assessment, Quality and Development at Des Moines University College of Osteopathic Medicine on September 1, 2015. Kevin D. Phelan, Ph.D., an Associate Professor in the Department of Neurobiology and Developmental Sciences at the University of Arkansas for Medical Sciences (UAMS), was awarded the Charles H. Lutterloh and Charles M. Lutterloh Medical Excellence Professorship in October of 2015. Dr. Phelan will be formerly invested at the College of Medicine’s Dean’s Honor Day on April 19th, 2016. The recipient of this honor holds the position for a three-year period and is provided with funds for salary support and educational scholarship. Dr. Phelan has received 12 red sash and 5 golden sash awards from the senior medical students for his excellence in teaching as a faculty member at UAMS. He currently serves as the Co-Director of the Division of Clinical Anatomy, the Director of the Anatomical Gift Program and the Co-Director of the Ultrasound Curriculum in the College of Medicine. 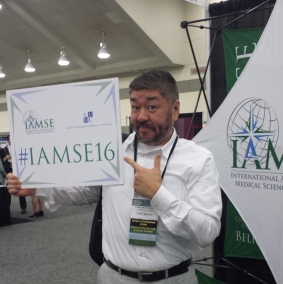 He has been a member of IAMSE since 2010 and currently serves as a review board member for the Medical Science Educator journal. He is also a member of the IAMSE abstract review board and the IAMSE board nomination committee.